Music has always been a vital component of social change. In the 50’s and 60’s singing played a large part in the social justice movement. The mission of our group is to bring songs back to our current rallies, marches and other events in support of peace, environmental, political, racial and social justice issues. Our goal is to resurrect Jon Fromer's Freedom Song Network which for a quarter of a century raised their voices for justice and freedom. We sing songs that people can sing along with us. 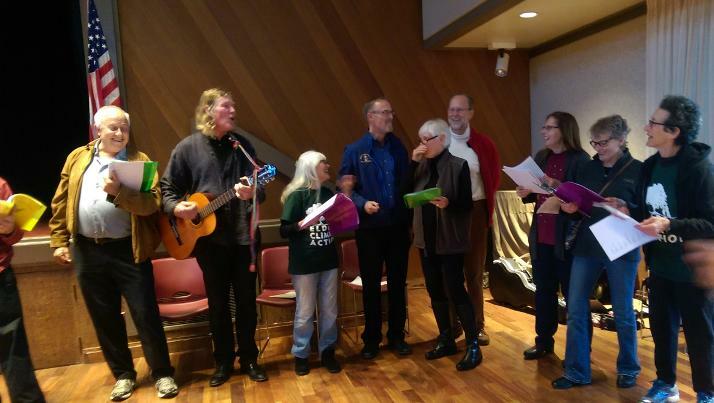 Members of our group will attend San Francisco Bay Area events that promote a healthy, safe, equitable world to sing songs suitable for all attending to join in. We are all volunteers and there will be no charge for our appearance at the events. We hold monthly meetings in Marin County, California to learn, share and practice songs. We welcome anyone who wants to simply sing, can play a musical instrument or help with coordination. Please contact us (see contact info below) to be added to our list of members or if you want us to perform at one of your organization's events. Friday, May 24 from 4-5pm Sing with the Seniors for Peace at the Redwoods Retirement Community in Mill Valle (the corner of Camino Alto & Miller).